Now in production for fifteen years, the Classics have become the pinnacle design, most popular, and indeed the signiture model of Godfrey Reels. The Classic and actually all Godfrey reel designs that closely followed were born of a love of Classic Walker, and Vom Hofe reels. A Walker TR-4 was my constant fishing companion in the 1960's and 70's. It was purchased at the now long defunct Angler's Den in Georgetown, Washington DC. The Classic features a dependable click and pawl tension system as demonstrated by the Landlocks, and a sweet run-out song that is understood by experienced anglers. The reel has modern design easy take down, easy spool change and left-hand right hand conversion. A reel for all anglers who appreciate the best! * Backing is 20 lb. Micron. 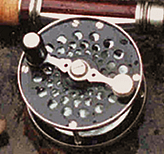 The model 253D Reel -- Is designed to reduce weight as much as possible in a very popular and very classical size. It works perfectly with 7 1/2 foot or longer 3 weight rods. The Two and Three Quarter inch Reels -- The standard reels for four and five weight lines with the quintessential Classic Reel size. These are best for cane rods in the 7 1/2 foot - 8 foot range. Definitely these are most favored model sizes. The Three inch 306 -- Greater capacity for either the 6 weight weight forward or double taper 5 weight lines and/or extra backing. vom Hofe Case:	 Reels for lines weights 3 through 6. Classic Reels come with warranty and maintenance paper with recorded Reel Serial Number in hand made draw string leather bag.